"A perfect primer for women everywhere who want to take action-whether their heading to their first town hall meeting or running for office." "The book we all need to remind us why the fight against white supremacy and patriarchy will actually set us free." Keep Marching is a practical guide and highly researched examination of the barriers that hold women back-and how to overcome them. and inspiration for how women can create change in their everyday lives and in the country as a whole. This book provides proven tactics, policy solutions, and strategies any woman can use to build her power. One in three women have experienced some form of sexual assault? When a group includes more women, its collective intelligence rises? The U.S. doesn't have paid family/medical leave but 177 other countries do? KRISTIN ROWE-FINKBEINER is the cofounder and CEO of MomsRising, an organization with over a million members across the nation working to increase economic security, decrease discrimination, and to build a nation where everyone can thrive. She is also a frequent public speaker, radio host, and an award-winning author. She has also been published and featured in numerous outlets, including: Politico, USA Today, CNN, MSNBC, the Washington Post, and HuffPost. "Keep Marching is the book we all need to remind us why the fight against white supremacy and patriarchy will actually set us free. Kristin's enthusiasm jumps through the pages. We are all lucky to have this book during a painful time in America." "Within every woman lies the power to spark a movement, and Keep Marching provides each of us with the tools and the inspiration we need to unleash our full potential. This extraordinary book can teach an entire generation of women-from every background-how to organize, mobilize, and catalyze a 21st century revolution for true equality." "Keep Marching is a powerful call to action for women everywhere-whether you're a seasoned organizer or someone who's getting involved for the first time. As Kristin [states], 'women can lift our nation.' Practical and inspirational guides like this will help us make it happen." "Keep Marching is an energizing roadmap, taking our focus from what we're up against [to] a vision that [allows] all women and families to live well. [This book shows] us how by working together and supporting one another, we can truly get there." "[A] must-read for new activists. I highly recommend picking up this hands-on guide full of the concrete information, an intersectional agenda, and a step-by-step action plan for every woman looking to make tangible change in their communities." "Keep Marching is a profound call to action for women seeking to overturn injustice and stand together. Kristin Rowe-Finkbeiner reminds us of what we're really fighting for." 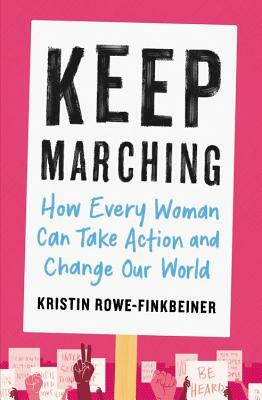 "Keep Marching is the 'cookbook' for activism that so many women (and all people who support them) in America need. Whether you care about paid leave, equal pay, criminal justice reform or immigration policy - or all of the above - this book will speak to you. Keep Marching makes absolutely clear that the time for us to band together - to listen, to plan, to organize and to act - is now." "Keep Marching is a groundbreaking manifesto. It's a book that every woman should read-full of compelling research and data that can change the world." "This book is a must-read for anyone who is curious about how to join the next feminist revolution. Kristin Rowe-Finkbeiner does us the immense favor of breaking down the language, the ideas and the tactics that work." "For anyone wanting to move up the ladder of engagement, to graduate from marches and rallies to strategy and planning, from activist to organizer, use this book as a field guide."